A monarch butterfly on milkweed. 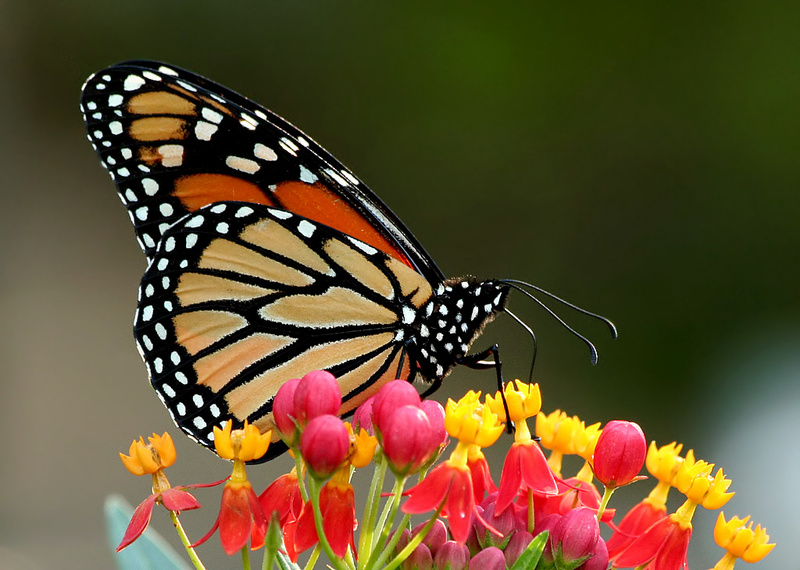 Monarchs are able to feed and lay eggs on milkweed, although the plant is toxic to most insects. Ingesting the chemistry of milkweed, moreover, makes monarchs a deadly meal for many potential predators. Bad weather and shrinking habitat are being blamed for a serious decline in the number of monarch butterflies wintering at isolated Mexican mountaintops. The cluster of monarchs in Mexico has shrunk to 1.65 acres — about the size of one and one-quarter football fields. That is the smallest area in 20 years of record-keeping. Because area translates into numbers, 2014 also has the smallest number of migrating monarchs, perhaps a few tens of millions, compared to as many as a billion butterflies in the winter of 1997. The migration of these “extraordinary organisms” is noteworthy for many reasons, says Ernest Williams, a professor of biology at Hamilton College in New York. “They have a strong graceful flight, a striking orange color with black spots. They are the most recognized butterflies. This insect that weighs as much as a paper clip flies thousands of miles, to overwinter in a very small, select set of mountaintops, escaping the freezing temperature we have up here, and then migrates back. 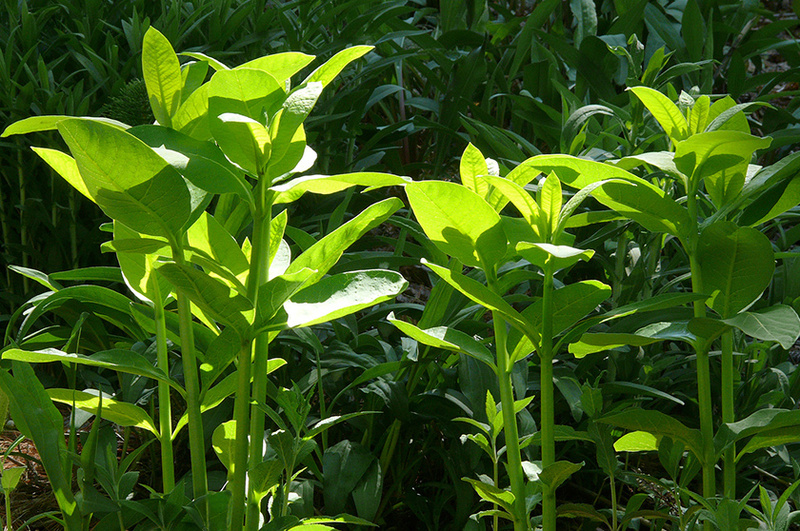 They incorporate plant toxins from milkweed as protection against predators,” he says. 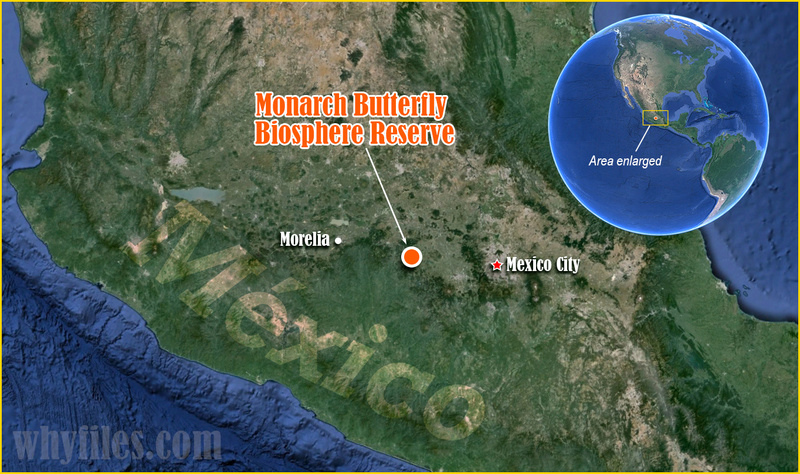 Mountains west of Mexico City are the winter refuge for most of the monarch butterflies in North America. Does the long-term decline in the winter population of monarch butterflies 100 miles west of Mexico City portend the disappearance of a remarkable insect migration? After migrating from the United States and Canada, monarch butterflies spend the winter in oyamel firs at a few mountain forests in Mexico. Roll over the photo to see a close-up of monarchs on a branch. The monarchs that winter on trees in Mexico have already traveled long distances from the East Coast, and particularly the Midwest. Scientists now know that the fir trees store solar heat in their trunks, which helps warm the butterflies. In spring, after five months of hanging out on the branches, the weather warms and the days lengthen, and the butterflies breed, then return north to feed and deposit eggs on milkweed. The young from those eggs continue north, often producing another generation. Finally, the shortening fall days trigger a reverse migration among the grandchildren or great grandchildren of that first generation of north-bound monarchs. 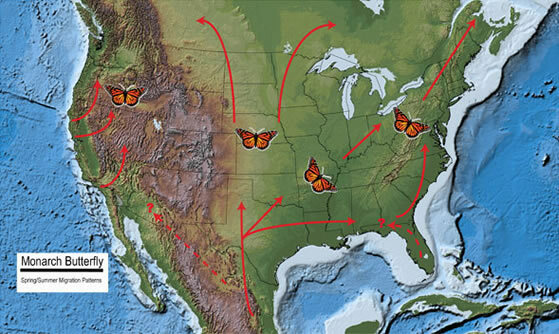 Monarch butterfly spring migration in North America; roll over map to see the route in the fall. Those southward-bound butterflies are several generations removed from the ancestors who departed Mexico in the spring. So how do they know the route? Taylor points to work by Steven Reppert of the University of Massachusetts, who has found that the monarchs use a “time-compensated sun compass” to orient themselves based on the sun, even though it transits the sky daily. “Reppert worked out the fact that the monarch has two internal clocks, one in the antennae, another in brain, that help keep the butterfly on course,” Taylor says. It’s possible that the butterfly, along with many migratory birds, also sets its course by detecting earth’s magnetic field. At any rate, after abandoning their summer breeding grounds, the monarchs head toward Texas, the gateway to Mexico. The heading must differ according to location, Taylor says. “Those that are leaving Wisconsin have a different heading than those from Minnesota or Kansas or Georgia. In each area, the monarchs use headings that are appropriate to get them to the Texas-Mexico border,” he says. Conditions up north and down south can threaten the butterflies. Monarch butterfly larvae require milkweed, including this common milkweed (Asclepias syriaca); roll over the photo to see the windborne seeds emerging from the seed pod. The enormous roosts of monarchs were discovered — by outsiders, at least — in the 1970s in forests in Michoacán and the Federal District of Mexico. With the monarchs from much of eastern North America crammed in a few postage-stamp locations, fire, storms or disease could have a devastating impact. The major problems now are weather — cold winters harm the butterflies — and logging, says Williams. “The Mexican government has been fighting against commercial logging, but there is still small-scale logging. As holes are punched in the forest, the temperature changes are more extreme, and that leads to butterflies freezing and dying, or becoming too warm and using up their energy supply” before they start the northward migration, he explains. Even the tourism that makes the reserves a source of income can harm the fragile ‘flies, which can be trampled while resting on paths in the reserves. Great fate in the great North? 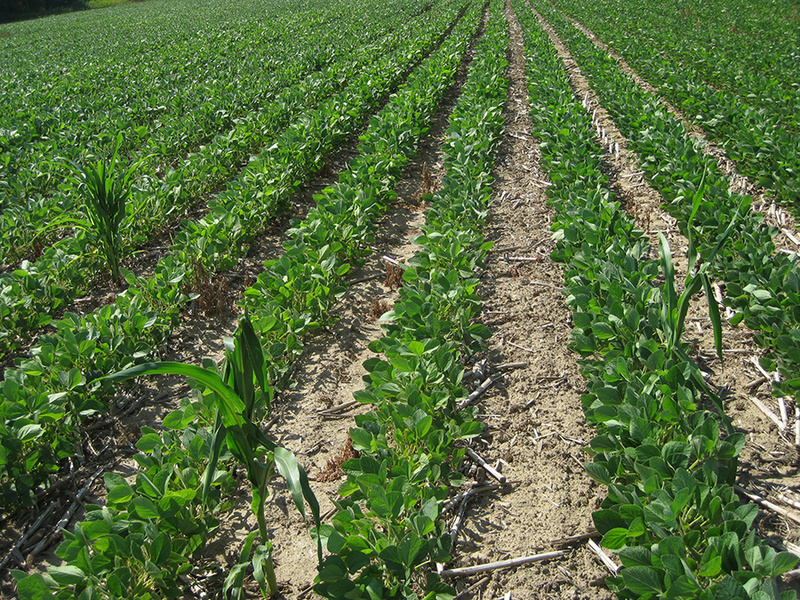 The only “weeds” in a field of Roundup Ready soybeans are a few volunteer seeds from herbicide-resistant corn planted last year. Not a milkweed in sight! In the northern farmland where monarchs breed, two related changes help explain the population crash: use of herbicide-resistant crops, and increased planting of corn to make ethanol fuel. Forty percent of the American corn crop — the largest single national crop in the world — is now being fermented into ethanol for blending into gasoline. A federal mandate in the 2007 Clean Energy Act to use ethanol gives farmers “an incentive to gobble up the remaining pasture, grasslands and wetland, and turn it into cropland,” says Taylor. 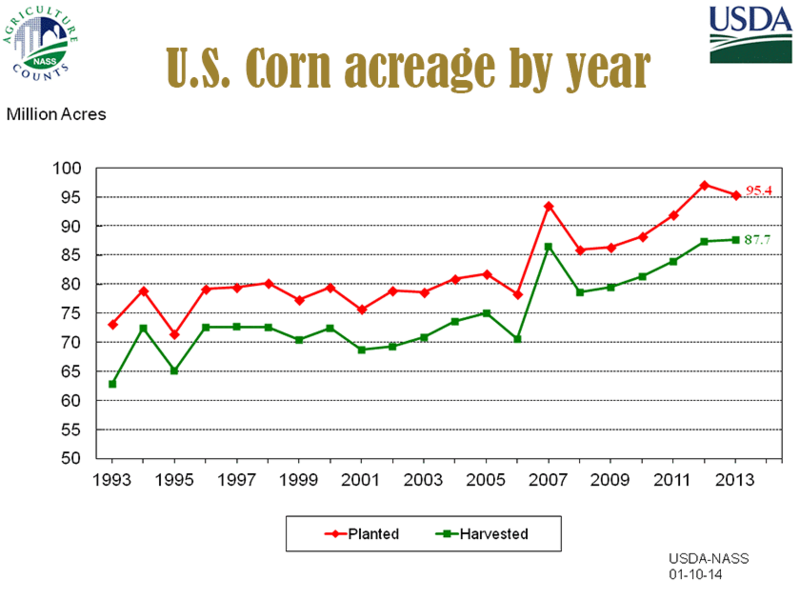 In 2013, corn covered an area the size of Montana. Some of the new land being planted with corn and soybeans was until recently protected by the Conservation Reserve Program, a federal effort to cut erosion by removing steep, hard-to-till fields from production. 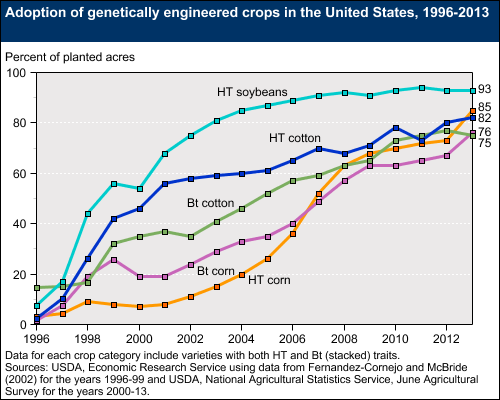 Taylor calculates that since 1996, the introduction of herbicide-tolerant soy and corn removed 150 million acres of land that could have borne milkweed. Roads and development accounted for 17 million additional acres, adding up to 167 million acres of lost monarch habitat. That’s 87 percent as big as Texas. 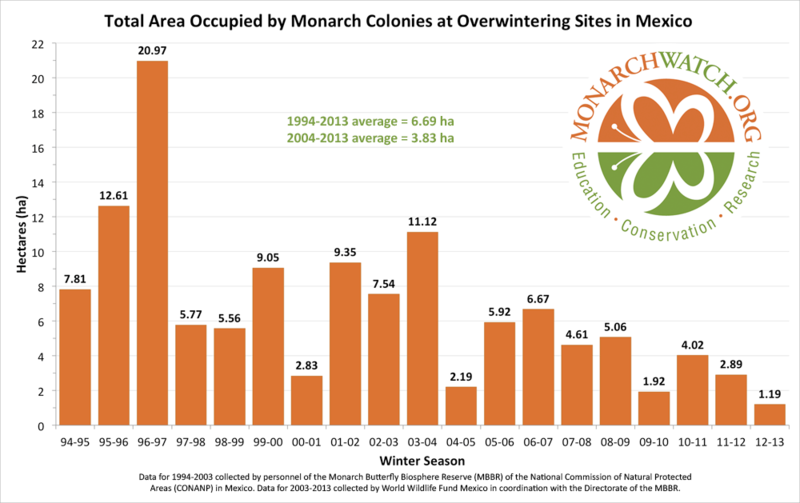 At an estimated density of 10 to 50 million monarchs per hectare, that wintering ground — just seven to 10 acres — could house 30 to 200 million monarchs in winter. 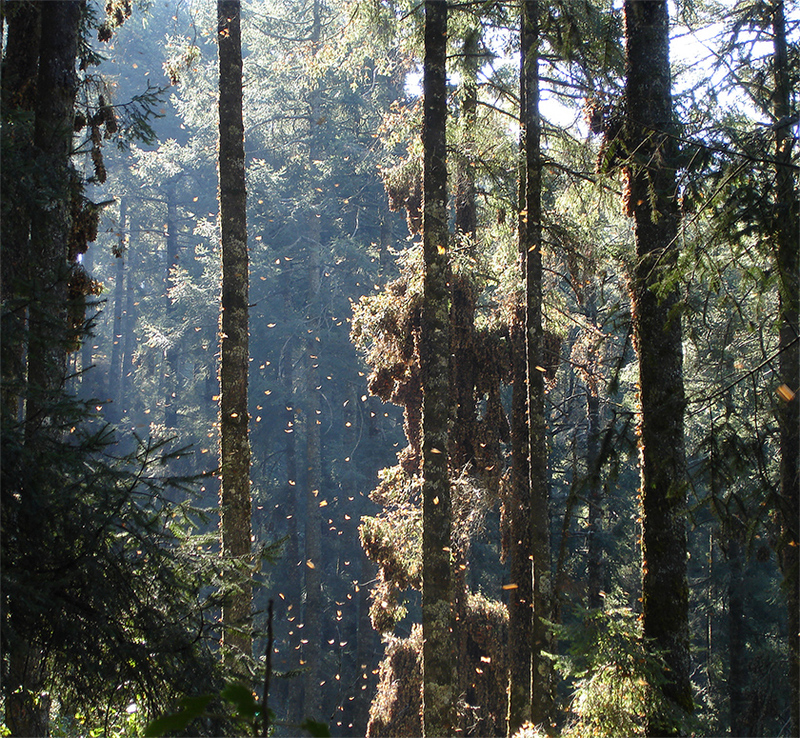 In Mexico, the monarchs have become minor celebrities and a tourist attraction. In the United States, they’ve been pressed into service in a variety of programs — in and out of school — devoted to the study and reproduction of the magnetic monarchs. 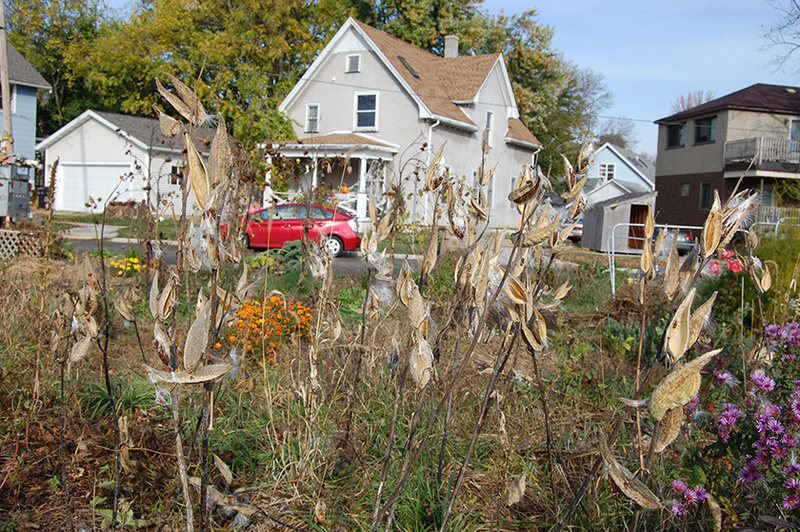 Was milkweed (notice the empty seedpods dangling from stalks) in this garden planted to make life easy for monarchs? The purple asters at the right are sure to interest native bees. Bird migration: Key explanation skewered!